Who were the Garvies and why did they come to the Uasin Gishu Plateau? The first white residents on the Plateau were the van Breda brothers – Bon, Dirk and Piet, who arrived in 1902. In the same year two more families arrived – Donald Garvie, a Scotsman, and his wife Cornelia (Nellie) Gertrude Steyn, and her youngest brother Stephen Steyn. The Steyns were a Boer family resident in Orange Free State. Donald Sutherland Garvie, born in Edinburgh on 3 June 1873 to Laurance Garvie and his wife Johanna Sutherland, had travelled to South Africa from Scotland as a boy, in 1880. He grew up in Knysna and Kimberley. An adventurous young man, he undertook a safari into Central Africa in 1899, and he was also present at the relief of Kimberley, because he and his four brothers all served in British regiments during the Boer War. When they arrived in East Africa, on 2 March 1904 five members of the Garvie family applied for land and were allowed to rent, illegally, 15,070 acres at ‘Nandi’ (on the Uasin Gishu Plateau). This land, four miles from the government fort at Kaptumo, was allocated by an official, James Walter Mayes, an Assistant Collector in the Kisumu district. Mayes was later dismissed for this transgression. Garvie then turned round and invited the Nandi to graze their stock on his land, on payment of rent. (DO, Kapsabet, Nandi Political Record Book, p.23). Unsurprisingly, the Nandi were unhappy with this arrangement, and the government hurriedly established boundaries for a Nandi Reserve, so that more land could not be alienated. In 1912 it was said that the Nandi had still not got over the Garvie land deal. In fact, the Garvies acquired 20,364 acres in all (Annual Report of Uasin Gishu District). The Garvies were given a guard, but when they housed him in their pigpen he left. They were then invited into the protection of the fort at Kaptumo, until a peace settlement with the Nandi in December 1905, after which they received an allocation of land on the Plateau. By now they had been joined from South Africa by Donald’s brothers John and George. John’s son James Stuart Garvie took part in Theodore Roosevelt’s hunting expedition in 1909-10 as a tracker. Donald sold his land to his brother John, stationmaster at Nakuru, and with his wife and three small children went to live in Parklands, Nairobi, probably in 1907. Donald began new ventures. He opened a boarding-house and a picture house or Bioscope, known as ‘Garvie’s Rooms,’ opposite Madame Rowe et Cie in Government Road, Nairobi. It showed entertainment every evening at 9 pm. The programme was changed twice a week, and on Wednesdays there was a matinee for children; the cost was 3 rupees a chair, and half price for children. Donald’s youngest brother George often played the pianola during performances and his daughters Dolly and Louise were fine singers who took part in Nairobi concerts. If the quality at the Bioscope was poor, there were jeers from the audience and bottles would rain down on the tin roof from the Travellers’ Club next door. 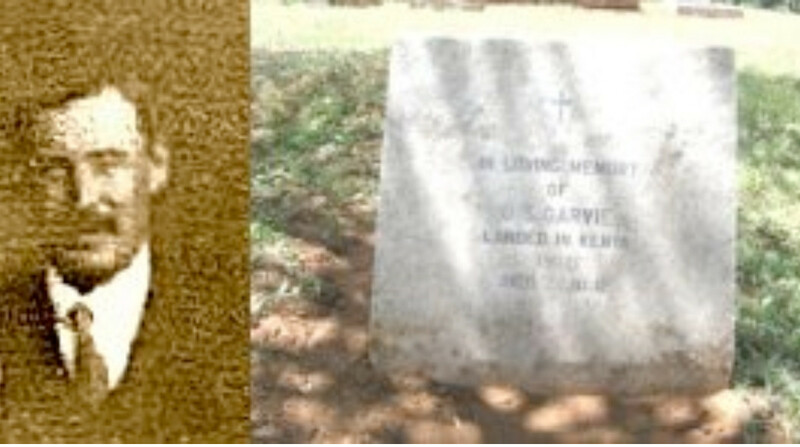 Garvie also edited the Nairobi newspaper The Advertiser and became a freemason. His daughter Dorothy married James Riddell, later mayor of Nairobi. Donald’s stay in Nairobi was to be short, because he died from pneumonia aged thirty-nine on 22 October 1912 and was buried in Nairobi South cemetery. The service was conducted by Rev G Burns and the pallbearers were members of the Masonic Royal Arch Chapter and Lodges Harmony and Scotia. A sprig of acacia tied with a blue ribbon was placed on the coffin before it was lowered into the grave. Donald’s obituary in the local newspaper said ‘he belonged to the quiet and unostentatious sphere of true gentility.’ His wife Nellie and his two daughters and son Donald Sutherland, born on 28 November 1907, stayed on in Kenya. In the 1930s Nellie moved to England and lived with her daughter in Kent. She died there in 1979. As for Stephen Steyn, no one knows what happened to him, except that he moved to the Lupa goldfield in German East Africa, but tradition has it that he died and is buried in an unmarked grave somewhere in Central Africa.